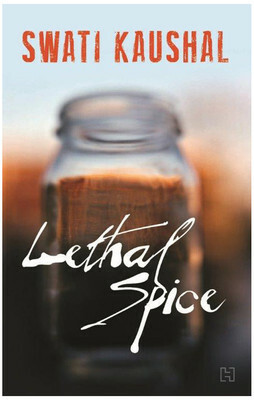 ‘Lethal Spice’ is a crime thriller set in the backdrop of a reality cooking show. It is October in Shimla. The air is crisp the mist is rising and the stakes are sky-high as the finalists of “Hot Chef” are pitted against each other in a live shoot at the historic gaiety theatre. A hundred-year-old stage steeped in tradition. Six contestants with a world to gain and everything to lose. Three judges who stand between them and their dreams. The spices are ground the fires are lit the knives have been sharpened. Then things start to go horribly wrong. Mala Joseph, judge and former winner of the reality show dies on stage. Shimla’s superintendent of police Niki Marwah is more determined than ever to get to the bottom of a perplexing mystery. This is the second appearance of Niki Marwah in Swati Kaushal’s books. She is one of the very well etched characters. A confident police officer who commands the respect of not only those working for her, but also her superiors is a perfect protagonist. She stands out distinctly even when the other characters are very well written. Each of them is described in detail. From the personalities of the contestants to the emotions flowing around, the author has done a brilliant job at descriptions. The second half of the book twists before it ends, ticking all the right boxes on the crime thriller check list. The pace at which things happen is what keeps you hooked. Its just apt. Any faster and it would over speed, any slower and the reader would lose interest. Swati Kaushal is the author of three best selling novels ‘Piece of Cake’, ‘A Girl Like Me’ and ‘Drop Dead’. An alumni of lady Sri Ram College, New Delhi and a MBA from IIM Calcutta, Swati has worked with Nestle India and Nokia mobile phones, India. While her home is in Connecticut, she is more often to be found wandering the secret gullies and mohallas of a good book, a cup of elaichi chai in hand. I picked up Lethal Spice with a “I know the butler did it” kind of a mindset, but it ended up making my weekend perfect. Its a very well cooked spicy story with a brilliant after taste.